A group of men moving in a group in a dance near Evans-Pritchard's tent (visible in background) at Yakwach cattle camp on the Sobat which Evans-Pritchard revisited in July 1935. 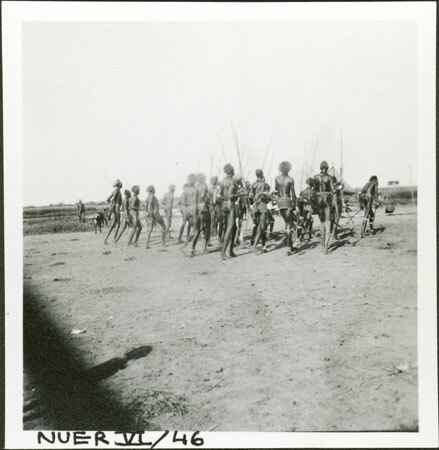 Such events were the main arena for courtship among Nuer youth, and often took the form of mock battles between village groups. Note on print reverse ms pencil - "64 2 A145" & print front border ms ink - "NUER VI/46"
Morton, Chris. "A Nuer dance" Southern Sudan Project (in development). 03 Jan. 2006. Pitt Rivers Museum. <http://southernsudan.prm.ox.ac.uk/details/1998.355.270.2/>.